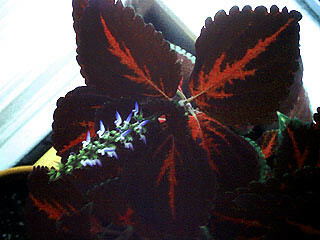 One of the new additions to my troops, a Coleus blumei, blooms into tiny purple flowers. They’re nice to look at now, but I’ll have to prune off the blooms before they start wilting and dropping invader-seeds into neighboring pots. Have you gotten the pencam to work with OS X? If so, how? Do tell! It’s the SD Pencam, so I just use a 32MB SD card with a USB reader.